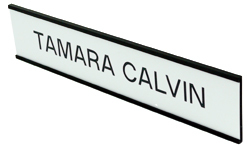 Our range of executive signs and engraved items offers you professional and elegant name badges and name plates. 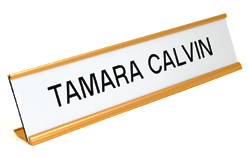 Be it your office door or your desk, a name badge or name plate will convey the message of your position and the person behind the desk. 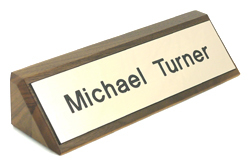 Our wall mountable name plates are made of quality materials. We have a wide range of products of different types such as acrylic Award displays, aluminum wall and desk signs, plaques and wooden awards and vinyl banners and signs. 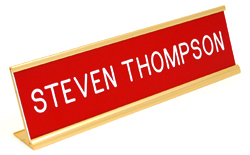 XstamperOnline offers you a variety of name badge choices, with the option of ordering a customized name badge or sign from the online catalog which can be downloaded below. 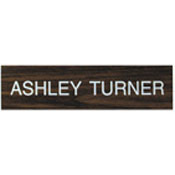 Scroll down to view all the different categories of Name Signs and Engraved Items that are available. Many of our most popular items can be designed and ordered online. Some of our more complicated items can be ordered using our .pdf catalog and printable order form. You can complete the order form and fax it into us at (559) 233-1518. 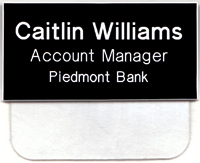 Engraved items can be found starting on page 57 of the Full Line Catalog.